Some animals possess extraordinarily enlarged or specialized structures used as weaponry for combat over mating rights – think of the huge antlers of elk or the tusks of elephants. However, in proportion to body size, many of the most extreme weapons are carried by tiny invertebrates. Like the mammals we are familiar with, male insects also do battle to win access to females, and in many cases, they wield bizarre structures in the form of enlarged or elaborated limbs, horns, heads, jaws, and even eyes! The array of possibilities is mind-boggling, and the way in which an animal’s mating system leads to the diversity of exaggerated armaments is a matter of current and ongoing research. We investigated the weaponry of a mysterious and hardly-studied insect – the cave crickets of New Zealand (locally known as cave wētā) of the species Pachyrhamma waitomoensis. These are omnivorous, nocturnal scavengers which forage in forests at night and retreat during daylight into dense aggregations within limestone karst caves. 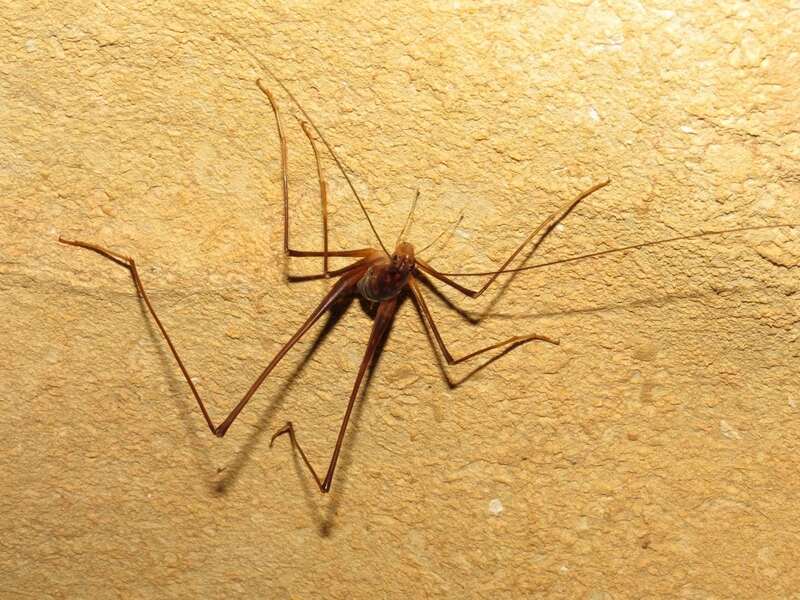 They possess enormously long legs and antennae, summing to a total length from hind-claw to antenna-tip of over 350 mm in males, despite having actual body lengths of only 30-35 mm. The extreme development of the touch-sensitive antennae is no mystery considering the dark caves they inhabit, but why the hind legs should be similarly elongated is not as obvious. One clue is that they are especially long in adult males, while females and juveniles have more normally-proportioned limbs. That suggests super long hind legs are especially important to the life history of adult males, and we were able to record, using infrared cameras, a behavior specific to them that directly involved the long legs: fierce, one-on-one fighting. In their fights, male P. waitomoensis turn back-to-back and engage each other with their long, thin hind limbs in a duel that, if not resolved, escalates to grappling with the whole body. We found that in these battles, males with hind legs longer than their opponent’s usually won early on, regardless of the difference in their total body size. In addition, fights were resolved at a less escalated level when the difference in leg length between the combatants was greater. Together, these findings indicate that the hind legs of male cave wētā are a form of exaggerated weaponry, and that victory in combat is a contributor to the evolutionary pressure to grow them ever longer. However, we were not able to identify what in particular about leg length makes them superior for fighting, which raises further questions about their function. Interestingly, despite their apparent importance to combat, we found that the scaling relationship between leg length and body size in these wētā is close to linear, whereas many other examples of animal weaponry scale non-linearly, such that the largest males have disproportionately large weapons. This makes them a useful point of comparison for understanding the overall patterns of weapon evolution and animal growth. They are also unusual among animal weapons in being very long and thin, rather than broad, reinforced, armed with spikes or otherwise fearsome like many of the other examples in the animal kingdom. As such, they may have more to teach us about the diverse functions that animal weapons can have in fights. The group that cave wētā belong to, the Rhaphidophoridae, are not well studied, and many other species among them have similar morphology to P. waitomoensis, so they hold great potential to inform further discoveries about the intricacies of evolution. These findings are described in the article entitled Combat in a cave-dwelling wētā (Orthoptera: Rhaphidophoridae) with exaggerated weaponry, recently published in the journal Animal Behaviour. This work was conducted by Murray Fea and Gregory Holwell from The University of Auckland.